M3; is a highly affordable solid wood range that maintains the Maxwood focus on quality & safety, while offering beautiful beds packaged in fewer, easy to ship boxes. M3 will soon be available in 5 colors (blue coming 2019) & the range expended to include new styles. Jackpot; is a versatile & stylish range that is easy & fast to assemble due to pre-built components. 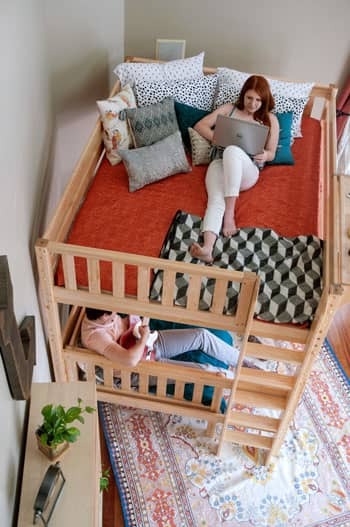 This diverse range includes the hugely popular All-In-One Lofts (space saving solutions at a great price), as well as beds, bunks & coordinating case goods. Also soon to be available in 5 colors & you can get more style this fall with the introduction of new fun fabrics. Maxtrix & Maxtrix XL; This fall you can discover new Maxtrix XL options such as queen lofts, perfect for urban living and twin XL over queen bunks, perfect for hospitality! Combined with the wide variety of solid hardwood furniture desks, dressers and chairs that Maxtrix is famous, and you’ll find endless possibilities! More about Maxwood: Maxwood Furniture is an industry leading manufacturer of bunks, lofts and youth bedroom sets. Our on-trend designs and quality, solid wood construction make us unique among our competitors and have allowed us to be the preferred partner of successful retailers. Since launching almost 15 years ago with our Maxtrix® Brand, we have grown to produce three distinct brands (Maxtrix, Jackpot & M3), all of which are in stock and ready to ship from our warehouse in Lexington NC. Along with our main brands, our in-house design team can create custom solutions for container direct customers. Our dedicated factory is able to actualize any furniture idea, in any finish, with low minimums and consistent, outstanding quality. To make your appointment, contact Peter at 203 916 2075 or online at http://www.maxwoodfurniture.com/dealer-information.